"Merya" redirects here. For the administrative ward in Tanzania, see Merya (Tanzanian ward). Approximate ethno-linguistic map of European Eastern Kievan Rus in the 9th century: The five Volga Finnic groups of the Merya, Mari, Muromians, Meshchera and Mordvins are shown as surrounded by the Slavs to the west, the (Finnic) Veps to the northwest, the Permians to the northeast the (Turkic) Bulghars and Khazars to the southeast and south. The Volga Finns (sometimes referred to as Eastern Finns) are a historical group of indigenous peoples of Russia living in the vicinity of the Volga, who speak Uralic languages. Their modern representatives are the Mari people, the Erzya and the Moksha Mordvins, as well as extinct Merya, Muromian and Meshchera people. The Permians are sometimes also grouped as Volga Finns. The modern representatives of Volga Finns live in the basins of the Sura and Moksha rivers, as well as (in smaller numbers) in the interfluve between the Volga and the Belaya rivers. The Mari language has two dialects, the Meadow Mari and the Hill Mari. Traditionally the Mari and the Mordvinic languages (Erzya and Moksha) were considered to form a Volga-Finnic or Volgaic group within the Uralic language family, accepted by linguists like Robert Austerlitz (1968), Aurélien Sauvageot & Karl Heinrich Menges (1973) and Harald Haarmann (1974), but rejected by others like Björn Collinder (1965) and Robert Thomas Harms (1974). This grouping has also been criticized by Salminen (2002), who suggests it may be simply a geographic, not a phylogenetic, group. Since 2009 the 16th edition of Ethnologue: Languages of the World has adopted a classification grouping Mari and Mordvin languages as separate branches of the Uralic language family. The Volga Finns are not to be confused with the Finns. The term is a back-derivation from the linguistic term "Volga-Finnic", which in turn reflects an older usage of the term "Finnic", applying to most or whole of the Finno-Permic group, while the group nowadays known as Finnic were referred to as "Baltic-Finnic". The Mari or Cheremis (Russian: черемисы, Tatar Çirmeş) have traditionally lived along the Volga and Kama rivers in Russia. The majority of Maris today live in the Mari El Republic, with significant populations in the Tatarstan and Bashkortostan republics. The Mari people consists of three different groups: the Meadow Mari, who live along the left bank of the Volga, the Mountain Mari, who live along the right bank of the Volga, and Eastern Mari, who live in the Bashkortostan republic. In the 2002 Russian census, 604,298 people identified themselves as "Mari," with 18,515 of those specifying that they were Mountain Mari and 56,119 as Eastern Mari. Almost 60% of Mari lived in rural areas. The Merya people (Russian: меря; also Merä) inhabited a territory corresponding roughly to what is now the area of the Golden Ring of Russia or Zalesye region of Russia, including the modern-day Moscow, Yaroslavl, Kostroma, Ivanovo, and Vladimir oblasts. They were briefly mentioned in the 6th century by Jordanes (as Merens) and were later described in more detail by the Primary Chronicle. Soviet archaeologists believed that the capital of the Merya was Sarskoe Gorodishche near the bank of the Nero Lake to the south of Rostov. They are thought to have been peacefully assimilated by the East Slavs after their territory became incorporated in the Kievan Rus' in the 11th century. One hypothesis describes the Merya as western branch of the Mari people rather than a separate tribe. Their names are basically identical, Merya being a Russian transcription of the Mari self-designation, Мäрӹ (Märӛ). The unattested Merya language is traditionally assumed to have been a member of the Volga-Finnic group. This view has been challenged by Eugene Helimski, who supposes that the Merya language was closer to the "northwest" group of Finno-Ugric (Balto-Finnic and Sami), and by Gábor Bereczki, who supposes that the Merya language was a part of the Balto-Finnic group. Some of the inhabitants of several districts of Kostroma and Yaroslavl present themselves as Meryan, although in recent censuses, they were registered as Russians. The modern Merya people have their own websites to show their flag, coat of arms and national anthem, participating in discussions on the subject in Finno-Ugric networks. 2010 saw the release of the film Ovsyanki (literal translation: “Buntings”, English title: "Silent Souls"), based on the novel of the same name, devoted to the make-believe life of modern Merya people. In recent years, a new type of social movement, the so-called "Ethnofuturism of Merya" was emerged. It is distributed in the central regions of Russia, for example, in Moscow, Pereslavl-Zalessky, Kostroma, Ples. In October 2014, adopted the 50-minute presentation "Merya Language" III Festival of Languages at the University Novgorod. In May 2014, the "New Gallery" in the city of Ivanovo during the "Night of Museums" opened art project mater "Volga.Sacrum". The Meshchera (Russian: Мещёра, Meshchyora) lived in the territory between the Oka River and the Klyazma river. It was a land of forests, bogs and lakes. The area is still called the Meshchera Lowlands. The first Russian written source which mentions them is the Tolkovaya Paleya, from the 13th century. They are also mentioned in several later Russian chronicles from the period before the 16th century. This is in stark contrast to the related tribes Merya and Muroma, which appear to have been assimilated by the East Slavs by the 10th and the 11th centuries. Ivan II, prince of Moscow, wrote in his will, 1358, about the village Meshcherka, which he had bought from the native Meshcherian chieftain Alexander Ukovich. The village appears to have been converted to the Christian Orthodox faith and to have been a vassal of Muscovy. The Meschiera (along with Mordua, Sibir, and a few other harder-to-interpret groups) are mentioned in the "Province of Russia" on the Venetian Fra Mauro Map (ca. 1450). Several documents mention the Meshchera concerning the Kazan campaign by Ivan the Terrible in the 16th century. These accounts concern a state of Meshchera (known under a tentative name of Temnikov Meshchera, after its central town of Temnikov) which had been assimilated by the Mordvins and the Tatars. Prince A. M. Kurbsky wrote that the Mordvin language was spoken in the lands of the Meshchera. In the village of Zhabki (Egorievsk district, Moscow Oblast), Meshchera burial sites were found in 1870. Women's bronze decorations identified as Finno-Ugric were found and dated to the 5th to 8th centuries. Very similar finds soon appeared in the Ryazan Oblast and the Vladimir Oblast, enabling archaeologists to establish what characterized the material culture of the Meshchera. 12 such sites were found from the Moskva River, along the Oka River to the town Kasimov. The general opinion is nowadays, that the Oka-Ryazan culture is identical to that of the Meshchera. The graves of women have yielded objects typical of the Volga Finns, of the 4th to 7th centuries, consisting of rings, jingling pendants, buckles and torcs. A specific feature was round breast plates with a characteristic ornamentation. Some of the graves contained well-preserved copper oxides of the decorations with long black hair locked into small bells into which were woven pendants. In the Oka River valley, the Meshchera culture appears to have disappeared by the 11th century. In the marshy north, they appear to have stayed and to have been converted into the Orthodox faith. The Meshchera nobility appears to have been converted and assimilated by the 13th century, but the common Meshchera huntsman and fisherman may have kept elements of their language and beliefs for a longer period. In the 16th century, the St Nicholas monastery was founded in Radovitsky in order to convert the remaining Meshchera pagans. The princely family Mestchersky in Russia derives its nobility from having originally been native rulers of some of these Finnic tribes. The Meshchera language is unattested, and theories on its affiliation remain speculative. Some linguists think that it might have been a dialect of Mordvinic, while Pauli Rahkonen has suggested on the basis of toponymic evidence that it was a Permic or closely related language. Rahkonen's speculation has been criticized by other scientists, such as by the Russian Uralist Vladimir Napolskikh. Nowadays, Mishar Tatar dialect is a Turkic language. The Mordvins (also Mordva, Mordvinians) remain one of the larger indigenous peoples of Russia. They consist of two major subgroups, the Erzya and Moksha, besides the smaller subgroups of the Qaratay, Teryukhan and Tengushev (or Shoksha) Mordvins who have become fully Russified or Turkified during the 19th to 20th centuries. Less than one third of Mordvins live in the autonomous republic of Mordovia, Russian Federation, in the basin of the Volga River. The Erzya Mordvins (Erzya: эрзят, Erzyat; also Erzia, Erza), who speak Erzya, and the Moksha Mordvins (Moksha: мокшет, Mokshet), who speak Moksha, are the two major groups. The Qaratay Mordvins live in Kama Tamağı District of Tatarstan, and have shifted to speaking Tatar, albeit with a large proportion of Mordvin vocabulary (substratum). The Teryukhan, living in the Nizhny Novgorod Oblast of Russia, switched to Russian in the 19th century. The Teryukhans recognize the term Mordva as pertaining to themselves, whereas the Qaratay also call themselves Muksha. The Tengushev Mordvins live in southern Mordovia and are a transitional group between Moksha and Erzya. The western Erzyans are also called Shoksha (or Shoksho). They are isolated from the bulk of the Erzyans, and their dialect/language has been influenced by the Mokshan dialects. The Muromians (Old East Slavic: Мурома) lived in the Oka River basin. They are mentioned in the Primary Chronicle. The old town of Murom still bears their name. The Muromians paid tribute to the Rus' princes and, like the neighbouring Merya tribe, were assimilated by the East Slavs in the 11th to 12th century as their territory was incorporated into the Kievan Rus'. The Muromian language is unattested, but is assumed to have been Uralic, and has frequently been placed in the Volga-Finnic category. A. K. Matveyev identified the toponymic area upon Lower Oka and Lower Klyazma, which corresponds with Muroma. According to the toponymy, the Muroma language was close to the Merya language. The speakers of Permic languages, the Permians, are sometimes considered to belong in the Volga Finnic group of peoples, because according to some theories their ancient homeland lies in the Northern part of the Volga River basin. ^ Jaycox, Faith (2005). The Progressive Era. Infobase Publishing. p. 371. ISBN 0-8160-5159-3. ^ Abercromby, John (2005) . Pre- and Proto-historic Finns. D. Nutt/Adamant Media Corporation. ISBN 1-4212-5307-0. ^ "Finno-Ugric religion: Geographic and cultural background » The Finno-Ugric peoples". Encyclopædia Britannica. 15th edition. Encyclopædia Britannica Online. 2008. Retrieved 2008-06-10. ^ Sinor, Denis (1990). The Cambridge History of Early Inner Asia. Cambridge University Press. p. 151. ISBN 0-521-24304-1. ^ Grenoble, Lenore (2003). Language Policy in the Soviet Union. Springer. pp. PA80. ISBN 978-1-4020-1298-3. ^ Voegelin, C. F.; & Voegelin, F. M. (1977). Classification and index of the world's languages. New York: Elsevier. ISBN 0-444-00155-7. ^ Ruhlen, Merritt (1991). A Guide to the World's Languages: Classification. Stanford University Press. p. 68. ISBN 0-8047-1894-6. ^ Salminen, Tapani (2002). "Problems in the taxonomy of the Uralic languages in the light of modern comparative studies". Helsinki.fi. ^ "Language Family Trees, Uralic". Ethnologue. Retrieved 28 May 2011. ^ "Всероссийская перепись населения 2002 года". Perepis2002.ru. ^ a b c d Janse, Mark; Sijmen Tol; Vincent Hendriks (2000). Language Death and Language Maintenance. John Benjamins Publishing Company. p. A108. ISBN 978-90-272-4752-0. ^ Petrov A., KUGARNYA, Marij kalykyn ertymgornyzho, #12 (850), 2006, March, the 24th. ^ "Merya". MultiTree. 2009-06-22. Retrieved 2012-07-13. ^ Wieczynski, Joseph (1976). The Modern Encyclopedia of Russian and Soviet History. Academic International Press. ISBN 978-0-87569-064-3. ^ Helimski, Eugene (2006). "The «Northwestern» group of Finno-Ugric languages and its heritage in the place names and substratum vocabulary of the Russian North". In Nuorluoto, Juhani (ed.). The Slavicization of the Russian North (Slavica Helsingiensia 27) (PDF). Helsinki: Department of Slavonic and Baltic Languages and Literatures. pp. 109–127. ISBN 978-952-10-2852-6. ^ Bereczki, Gábor (1996). "Le méria, une language balto-finnoise disparue". In Fernandez, M.M. Jocelyne; Raag, Raimo (eds.). Contacts de languages et de cultures dans l'aire baltique / Contacts of Languages and Cultures in the Baltic Area. Uppsala Multiethnic Papers. pp. 69–76. ^ 13/07/2012+26°C. "Silent Souls (film)". Themoscownews.com. Archived from the original on 2014-03-01. Retrieved 2012-07-13. ^ "Meshcherian". MultiTree. 2009-06-22. Retrieved 2012-07-13. ^ Aikio, Ante (2012). "An essay on Saami ethnolinguistic prehistory" (PDF). Mémoires de la Société Finno-Ougrienne. Helsinki, Finland: Finno-Ugrian Society. 266: 63–117. Retrieved 5 July 2017. ^ "Вопросы Владимиру Напольских-2. Uralistica". Forum.molgen.org. Retrieved 2012-07-13. ^ Uibopuu, Valev; Herbert, Lagman (1988). Finnougrierna och deras språk (in Swedish). Studentlitteratur. ISBN 978-91-44-25411-1. ^ "Muromanian". MultiTree. 2009-06-22. Retrieved 2012-07-13. ^ Taagepera, Rein (1999). The Finno-Ugric Republics and the Russian State. Routledge. p. 51. ISBN 978-0-415-91977-7. ^ Матвеев А. К. Мерянская проблема и лингвистическое картографирование // Вопросы языкознания. 2001. № 5. ^ Minahan, James (2004). The Former Soviet Union's Diverse Peoples. ABC-CLIO. p. 115. ISBN 978-1-57607-823-5. Klima, László (1996). The linguistic affinity of the Volgaic Finno-Ugrians and their Ethnogenesis. Oulu: Societas Historiae Fenno-Ugricae. Retrieved 2014-08-26. Aleksey Uvarov, "Étude sur les peuples primitifs de la Russie. Les mériens" (1875). Taagepera, Rein (1999). The Finno-Ugric Republics and the Russian State. Routledge. p. 51. ISBN 978-0-415-91977-7. This article contains content from the Owl Edition of Nordisk familjebok, a Swedish encyclopedia published between 1904 and 1926, now in the public domain. Finno-Ugric, Finno-Ugrian or Fenno-Ugric is a traditional grouping of all languages in the Uralic language family except the Samoyedic languages. Its commonly accepted status as a subfamily of Uralic is based on criteria formulated in the 19th century and is criticized by some contemporary linguists. The three most-spoken Uralic languages, Hungarian, Finnish, and Estonian, are all included in Finno-Ugric, although linguistic roots common to both branches of the traditional Finno-Ugric language tree are distant. The Uralic languages form a language family of 38 languages spoken by approximately 25 million people, predominantly in Northern Eurasia and in the European Union. The Uralic languages with the most native speakers are Hungarian, Finnish, and Estonian, which are official languages in Hungary, Finland, and Estonia, respectively. Other Uralic languages with significant numbers of speakers are Erzya, Moksha, Mari, Udmurt, and Komi, which are officially recognized languages in various regions of Russia. The Republic of Mordovia is a federal subject of Russia. Its capital is the city of Saransk. As of the 2010 Census, the population of the republic was 834,755. Ethnic Russians (53.4%) and Mordvins (40.0%) account for the majority of the population. The Mordvins, also Mordva, Mordvinians, Mordovians, are an Uralic people who speak the Mordvinic languages of the Uralic language family and live mainly in the Republic of Mordovia and other parts of the middle Volga River region of Russia. 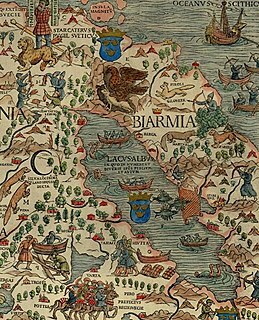 Bjarmaland was a territory mentioned in Norse sagas since the Viking Age and in geographical accounts until the 16th century. The term is usually seen to have referred to the southern shores of the White Sea and the basin of the Northern Dvina River as well as, presumably, some of the surrounding areas. Today, those territories comprise a part of the Arkhangelsk Oblast of Russia. Finnish: Jumala or Estonian: Jumal or Mari: Jumo means "god" in the Finnic languages and those of the Volga Finns, both the Christian god and any other deity of any religion. The word is thought to have been the name of a sky god of the ancient Finnic-speaking peoples. Jumala as a god of the sky is associated with the related Estonian Jumal, Mari Jumo and Bjarmian Jomali and is thought to stem from an ancient tradition of the Finno-Ugric peoples. A related term appears also in the Mordvinic languages, jondol "lightning", literally "fire of Juma". Finno-Volgaic or Fenno-Volgaic is a hypothesis of a subgrouping of the Uralic languages that tried to group the Finnic languages, Sami languages, Mordvinic languages and the Mari language. 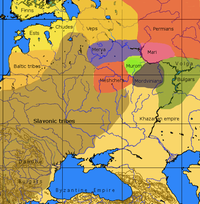 It was hypothesized to have branched from Finno-Permic languages about 2000 BC. The Finno-Samic languages are a hypothetical subgroup of the Uralic family, and are made up of 22 languages classified into either the Sami languages, which are spoken by the Sami people who inhabit the Sápmi region of northern Fennoscandia, or Finnic languages, which include the major languages Finnish and Estonian. The grouping is not universally recognized as valid. The Finno-Permic languages are a proposed subdivision of the Uralic languages which comprises the Baltic-Finnic languages, Sami languages, Mordvinic languages, Mari language, Permic languages, and likely a number of extinct languages. In the traditional taxonomy of the Uralic languages, Finno-Permic is estimated to have split from Finno-Ugric around 3000–2500 BC, and branched into Permic languages and Finno-Volgaic languages around 2000 BC. Nowadays the validity of the group as a taxonomical entity is questioned. The Finnic peoples or Baltic Finns are Finno-Ugric peoples inhabiting the region around the Baltic Sea in Northern Europe who speak Finnic languages, including the Finns proper, Estonians, Karelians, Veps, Izhorians, Votes, and Livonians as well as their descendants worldwide. In some cases the Kvens, Ingrians, Tornedalians and speakers of Meänkieli are also included separately rather than being a part of Finns proper. Torama is a music group from Saransk, Mordovia in Russia, performing traditional songs and music of Mordvin ethnic groups, namely Erzya, Moksha, Shoksha, and Qaratay. The Mokshas are a Mordvinian ethnic group belonging to the Volgaic branch of the Finno-Ugric peoples who live in the Russian Federation, mostly near the Volga and Moksha rivers, a tributary of the Oka River. Indigenous peoples of the Subarctic are the aboriginal peoples who live in the Subarctic regions of the Americas, Asia and Europe, located south of the true Arctic. This region includes the interior of Alaska, the Western Subarctic or western Canadian Shield and Mackenzie River drainage area, the Eastern Subarctic or Eastern Canadian Shield, Scandinavia, Western Russia and East Asia. Peoples of subarctic Siberia and Greenland are included in the subarctic; however, Greenlandic Inuit are usually classified as Indigenous peoples of the Arctic. Uralic is a language family located in Northern Eurasia, in the countries of Finland, Estonia, Hungary, in other countries Uralic languages are spoken by a minority of the population, these languages are spoken in far-northern Norway, in far-northern Sweden, and Russia. In Latvia, in some of the far-northern coastal areas of Courland (Kurzeme) region, an extinct Uralic language was spoken - Livonian.